! Free Shipping Special ! Purchase any combination of 8 items or more and get free UPS ground shipping. This special offer does not apply to our Gel Ice Packs, Large Styrofoam Coolers, Nightcrawlers, and Mealworms (live bait products). Select the "Free Shipping" option when you choose your shipping method upon checkout. All of our products are harvested, processed, and packaged in Oregon. 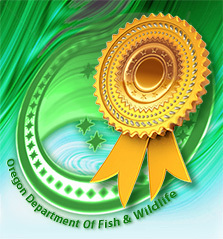 Dedicated to the preservation, restoration, and enhancement of sport fisheries and the businesses dependent upon them. For our Northwest fishermen you will find a great selection of D & G Bait, Inc., Guide's Choice® products available at: All BI-Mart Stores, Fisherman's Marine & Outdoor, Fred Meyers, Great American Tackle in Clackamas Oregon, Reel Tackle in Sandy Oregon, Mazama Sporting Goods in Eugene Oregon, and the 76 Food Mart in Troutdale Oregon, along with many other fine retail outlets along the Willamette and Columbia rivers. Fishing bait here online that includes nightcrawlers, salmon eggs, sand shrimp, cured prawns, giant mealworms, striped shrimp, sturgeon candy, catfish treats and more. Established in 1980, D. & G. Bait, Inc. has become one of the largest wholesale fishing bait distributors here in the Pacific Northwest. With the addition of our new D & G Bait Shop we now have the ability to offer you this extensive line of fishing bait here online at a great price. We have developed a simplified system to find the baits of your choice. Simply select freshwater or saltwater and the appropriate bait will be listed. Now you are ready to select the products that will bait the game fish you are fishing for. Freshwater or saltwater, most of our bait can be used for fishing just about anywhere. Over the years we have created and perfected what we and fishermen of the Northwest have found to be the finest bait products in the world. The products America fishes today. With generations of family fishing and field testing along with 30 years of scientific studies we have developed a line of bait products and curing ingredients that fish cannot resist. "There isn't any better fish bait products out there for catching fish"
Our products are very unique and have a definite advantage to fisherman, guides, and bait distributors who, nationwide, have been pleased to use and incorporate our fishing bait into their product line with great success. We are sure that some, if not all of our products will become your bait of choice. Many wholesalers and distributors have found this to be true. We begin by using the real "food source" that fish actually consume. Fishing bait that includes the packaging of live perishables, processed, frozen, cured, preserved, color enhanced, and custom packaged attractively for the fishermen's eye. These methods ensure maximum freshness and extended shelf life.
! Our Products Sell Because They Really Work ! Over 30 years of experience has proven just exactly that. All of the finest custom packaged fishing bait products that a fish could ever dream of. All are cured, pickled, fresh, and frozen with the renowned Guide's Choice® label. Guide's Choice® Catfish Treats are one of the most sought after baits anywhere catfish are fished for. They are made from whole and sections of different types of fish then cured, pickled, and brined in special sauces catfish and bottom fish go crazy over. Catfish treats are like candy to a fish. That's why catfish treats catch fish so well. This product is becoming very popular in California, the Midwest and the South where catfish are king. Our Pickled Sturgeon Candy has proven to be the best selling pickled bait product sold any where in the Pacific Northwest. Not only do Sturgeon love it! Which is why we named it what we did. Sturgeon Candy has become a popular bait for catfish and bottom fish in the Northwest, Midwest states as well as many other states. Whole and sections of fish are pickled in proven fish catching sauces, which extend shelf life freshness. All fish flavors are professionally packed and labeled for both fish and fishermen which both can't resist. Frozen bait is the natural food that both freshwater and saltwater game fish find irresistible. These products can be found in both individually custom labeled, vacuum-sealed packaging for maximum freshness, as well as bulk. We professionally process salmon eggs taken from the Pacific Northwest. These are so beautifully cured, that fish and fishermen find this product to be quite irresistible. These are the finest eggs anywhere! Guide's Choice® egg skeins are available in a wide array of custom packaging. Single eggs are hand selected and taken directly from salmon, then cured and processed immediately. These eggs are tested throughout the curing process to make certain the product is superior to any other in the market today. Freshwater fisherman and distributors nationwide feel Guide's Choice® single eggs are the finest salmon eggs anywhere. Great for trout, steelhead, salmon, and many other freshwater fish. Our fresh cured Guide's Choice® products are processed in our special cure that enhances the natural flavors of each cured product that we provide. These products are also cured in various fluorescent colored dyes, and custom packed for maximum freshness. Fresh cured fishing bait that is an extremely effective fish catching product for both fresh and saltwater game fish. Guide's Choice® nectars or scents make sense! There made from real prawns, sand shrimp, and salmon eggs, purified into a fish catching potion that fish find irresistible. Commonly used to enhance the scent of fresh bait, lures, yarn and fly's. This product has become quite popular throughout the Pacific Northwest with guides and fishermen who want that added edge of catching more fish. Our live products are so fat, sassy, wiggly, squirmy and fresh that it takes longer to get them on the hook than it does to catch a fish. Live products included here online are nightcrawlers, and mealworms. "Try our fishing bait products, you will love them. The fish sure do!" D & G Bait has a reputation for being a leader in this industry by developing environmentally friendly fishing bait products. We have initiated strict standards for bait that will not jeopardize the well being of juvenile fish in our waterways. "Meets Oregon Guidelines" is now required by the Oregon Department of Fish & Wildlife (ODFW) for cured Salmon Egg products sold in Oregon. But, just what does that mean ? And why do we need to comply ? Cured Salmon Eggs have been a popular Salmon and Steelhead bait for decades. During a recent study by ODFW they discovered that a common ingredient in many cures can be toxic to juvenile Salmon and Steelhead. D. & G. Bait, Inc. is proud to certify that our Guides Choice brand products are environmentally friendly and meet or exceed the Oregon guidelines. "Meets Oregon Guidelines� seal of approval labeling on our refrigerators and displays inform anglers that our fishing bait products surpass these new standards. We appreciate this opportunity to collaborate with ODFW and to be partners in the protection of our fishery resources along with educating the customers we serve. My father, at the age of six, caught his first salmon and his father, my grandfather, had to sell the fish to buy a pair of shoes. I heard that story a lot. My grandfather hammered spinners and poured lead fishing weight to sell to the fishermen in the Willamette and Columbia rivers. His spinners are still fished today after 70 years of catching game fish. A lot of fish!
! Give Them A Try ! Please try our various bait products that you think will work the best in your area to catch the type of fish your fishing for. These bait products really are the hottest baits in the Northwest. We are talking 3 states for 25 years! We know they will catch fish anywhere! Then be ready to be the envy of other fishermen. Over a hundred fishing guides in the northwest buy our products to make a living. To accomplish this they must produce fish to have their customers come back. This says a lot about the quality of D & G Bait products. the following non profit organizations. NSIA, Coastal Conservation Association, Oregon Department of Fish and Wildlife Fishing Events, Washington Department of Fish and Wildlife Fishing Events, Oregon Wildlife Heritage Foundation, Free Fishing Day Events, Cast for Kids Foundation, Northwest Steelheaders Association, Southwest Washington Anglers, Children's Home Society, Portland Parks and Recreation-Free Fish Day committee, U.S. Department of the Interior-Catch A Special Thrill Fishing Event, Fisherman's Marine and Outdoor-Fishing Derbys, and the Independent Living Program-Free Fishing Event.